Kenai Fjord Tours (Ciri) hired TMC to remove a smaller facility and replace it with a new and improved docking facility. Construction included the installation of float guide system, new gangway hoisting davit and the placement of the 116’ long x 29’ wide pontoon style float as well as a 120’ gangway at Fox Island. 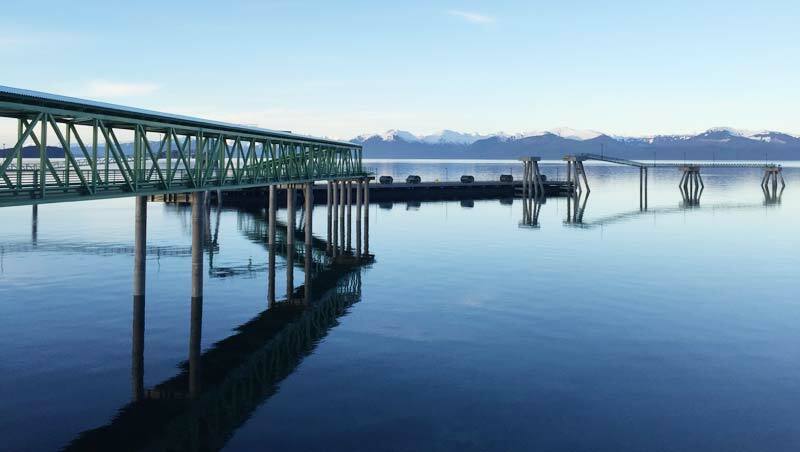 Turnagain was contracted to refurbish the fender system on the Pioneer Dock in Homer Alaska. The upgrade includes the installation of 5 new energy absorbing fender panels, driving 10 new 24” diameter steel fender pin piles, the refurbishment of 4 existing fender panels, and the construction of a new covered pedestrian walkway. Puffin Electric was contracted to perform electrical upgrades and R&M Consulting is the engineer of record. 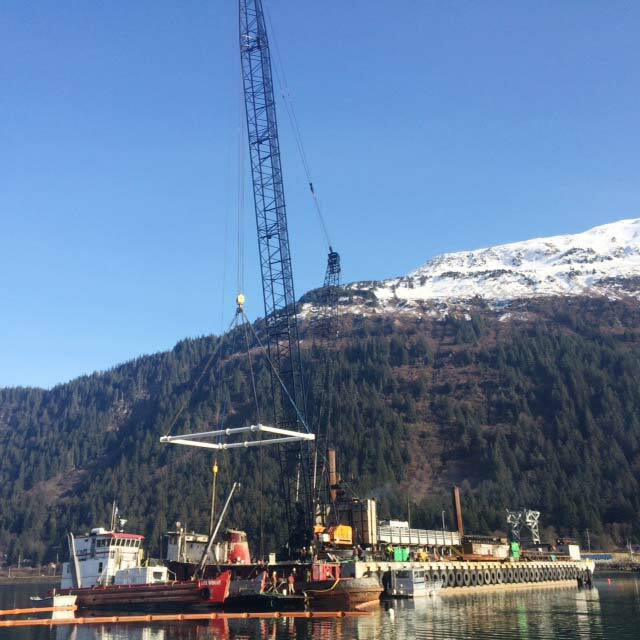 Turnagain was contracted to install approximately 12,000 square feet of new timber floats moored in place with approximately 70 each 16" diameter steel pile. The new harbor floats are equipped with, upgraded electrical service, domestic water service, and firefighting water lines. The timber floats were designed by AJD Engineering and constructed by Transpac Marinas. Bering Industrial and Puffin Electric were contracted to install the mechanical and electrical systems. Worked with SAGE Technologies and the USACE to provide the City of Perryville a new boat launch facility. 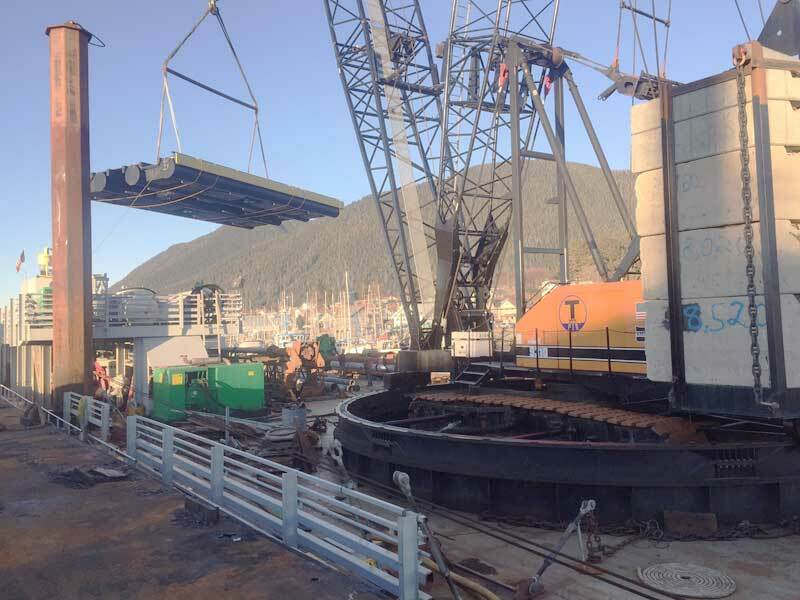 Using a crane barge, TMC performed the in-water work associated with the ramp including dredging, armor placement, and installation of the precast concrete planks and sleeper beams. TMC has been contracted to install a breasting dolphin and boat ramp as Phase IV of the Ouzinkie Municipal Dock facility construction. Work to be performed includes rock anchored dolphin and fender piles, dolphin cap, fender system, precast concrete boat ramp, and a high mast light structure. 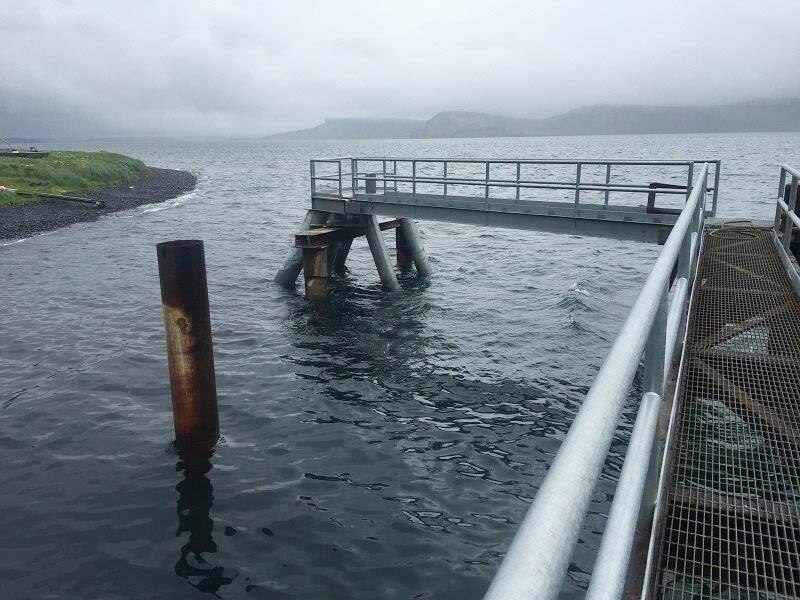 Contracted by the Alaska Department of Transportation & Public Facilities, TMC performed upgrades and rehabilitation to the Akutan City Dock including the installation of a new mooring dolphin and fender system repairs. 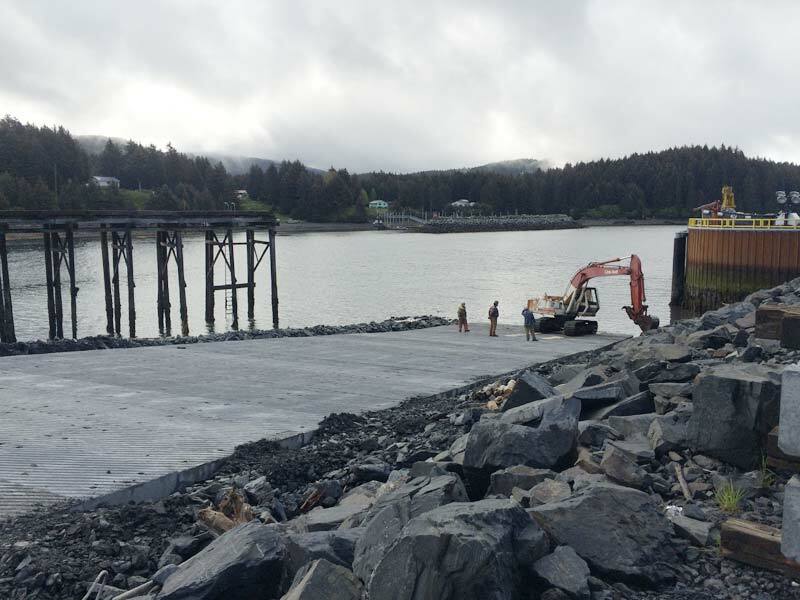 TMC worked with the AK DOT & PF to complete upgrades to the existing dock facility in Cold Bay. This work included steel and timber fender pile replacement, precast concrete deck repairs, and miscellaneous steel structure. 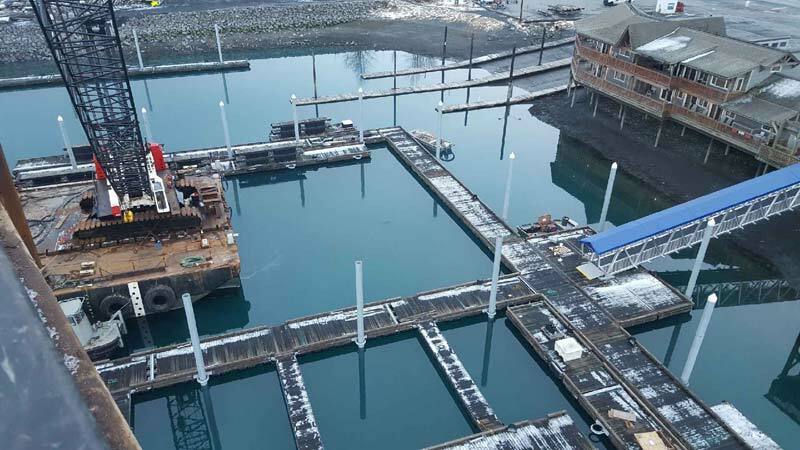 Hoonah Cruise Ship Dock Co. hired Turnagain Marine Construction to provide a cruise ship berthing facility in Hoonah, Alaska, providing direct access to the upland amenities. Under this design-build contract, Turnagain teamed with Moffatt & Nichol, Transpac Marinas, and Jesse Engineering amongst others to provide a turn-key facility to meet the cruise ship facility demands. Design and construction include dolphins with socketed and rock anchored piling, floating pontoon, trestle and transfer span with associated supports, and electrical distribution. 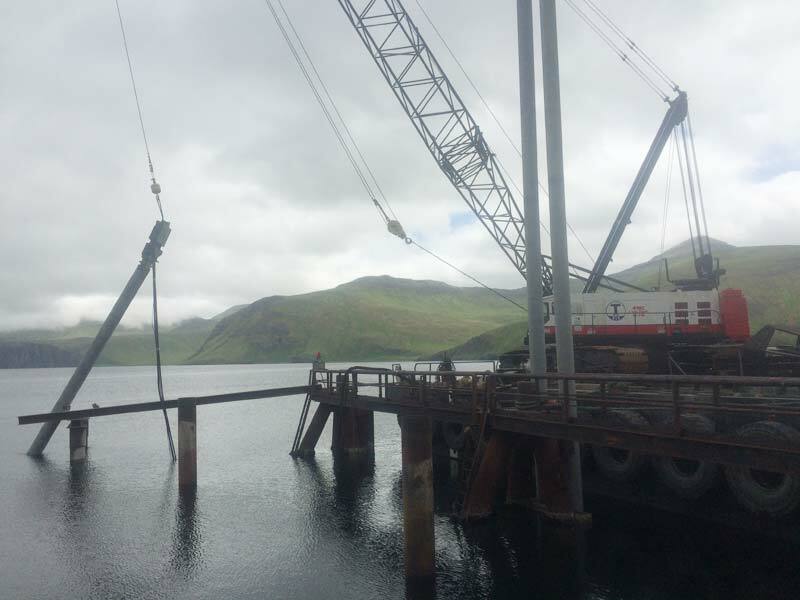 The City of Unalaska hired TMC to remove and replace the existing upland and floating facilities associated with C Float with the Robert Storrs Harbor. Construction includes demolition, socketed pile, floating dock, cast-in-place concrete, site work, and both upland and dock utilities. 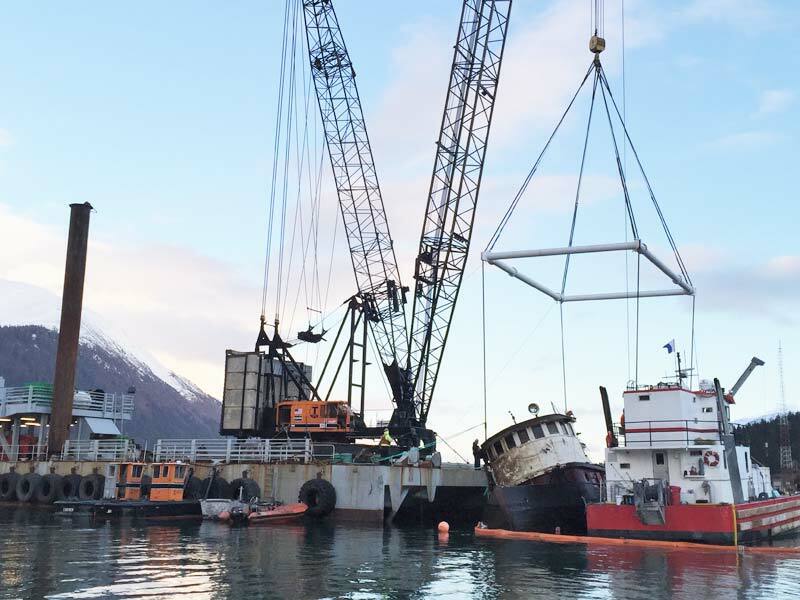 Working in conjunction with Global Diving & Salvage and the USCG, Turnagain utilized its crane barge, the Brightwater, to raise the World War II tugboat Challenger from the bottom of the Gastineau Channel near Juneau. Crews reconfigured the Brightwater to pass beneath the bridge to Douglas Island and move safely into position. The old tugboat weighing in excess of 150 tons was hoisted and dewatered before then being towed away for demolition. 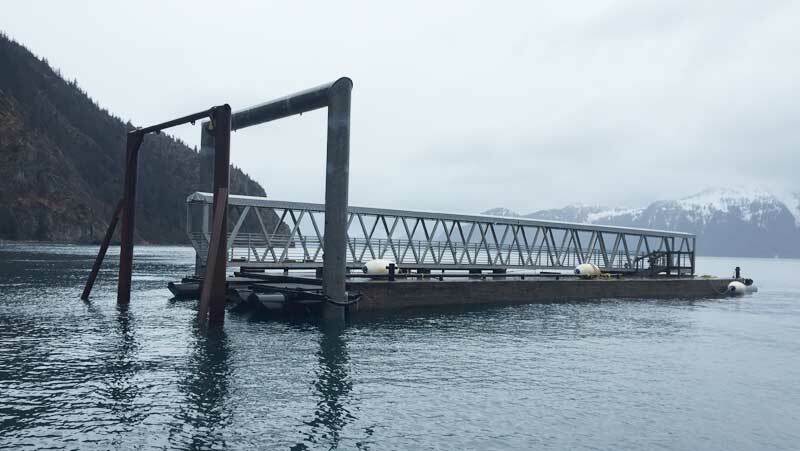 Turnagain Marine Construction was contracted by the Alaska Department of Transportation to complete improvements to the Ketchikan Ferry Terminal. Improvements include the removal of a 17 pile dolphin system, the installation of three new mooring dolphin structures comprised of 14 new 30" steel piles, and the construction of a new sidewalk and covered pedestrian walkway. The Gary Paxton Industrial Park Facility (GPIP) had been long awaited by the City and Borough of Sitka. This design‐build project presented some unique challenges in order to provide the owner with all necessary design criteria. Turnagain was selected as best value proposal. 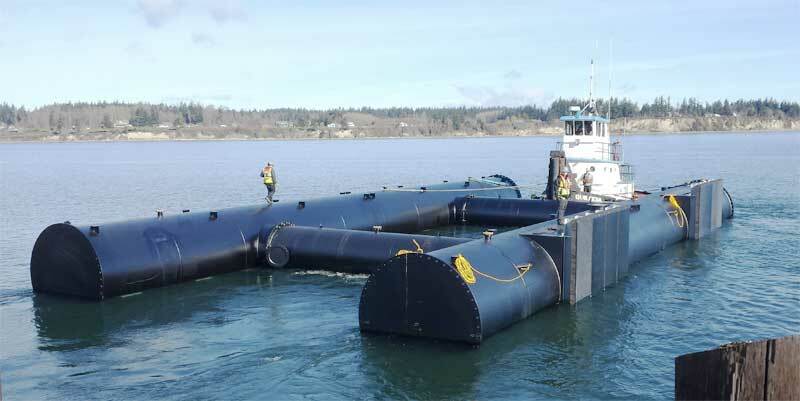 Two floating dock options were analyzed with a final decision to provide the city with a 19,000 square foot retro‐fitted ABS Class barge to be the basis of the design. The barge was dry‐docked and inspected. 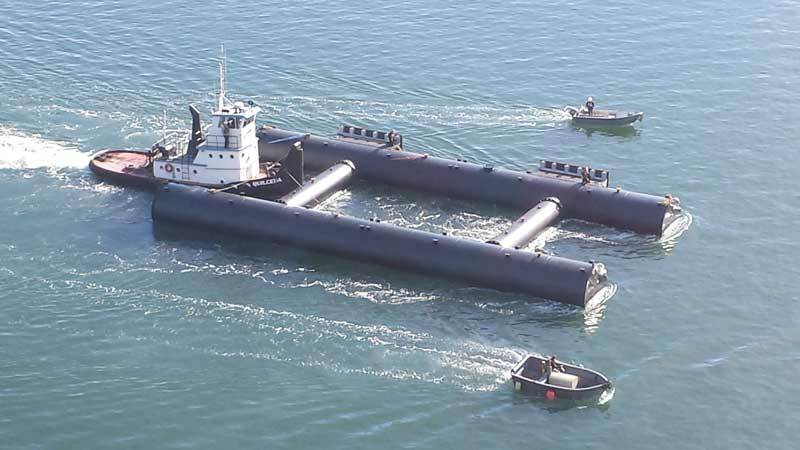 To achieve a 50‐year design life with minimal maintenance the barge was retro‐fitted with a new coating system, full anode replacement, and a high capacity wear deck with the ability to handle a 260 kip axel load. 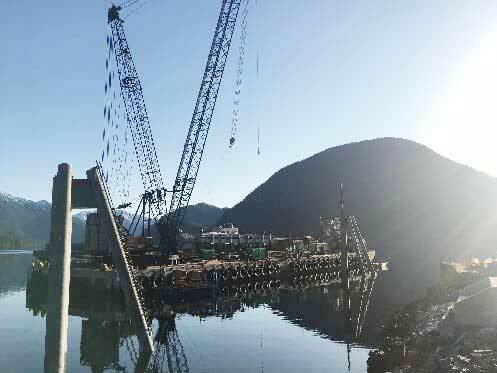 Turnagain designed and constructed large pile dolphins to moor the floating dock. 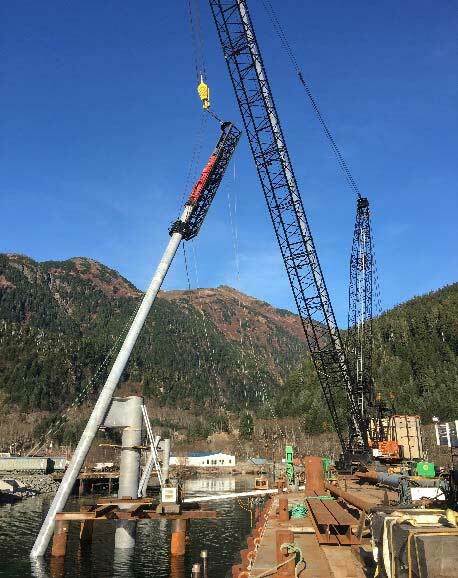 Turnagain was able to provide the owner a cost savings by designing the batter sleds into the dolphin caps, reducing the amount of required falsework. Onsite construction of the GPIP Facility presented some complex construction techniques and working conditions. 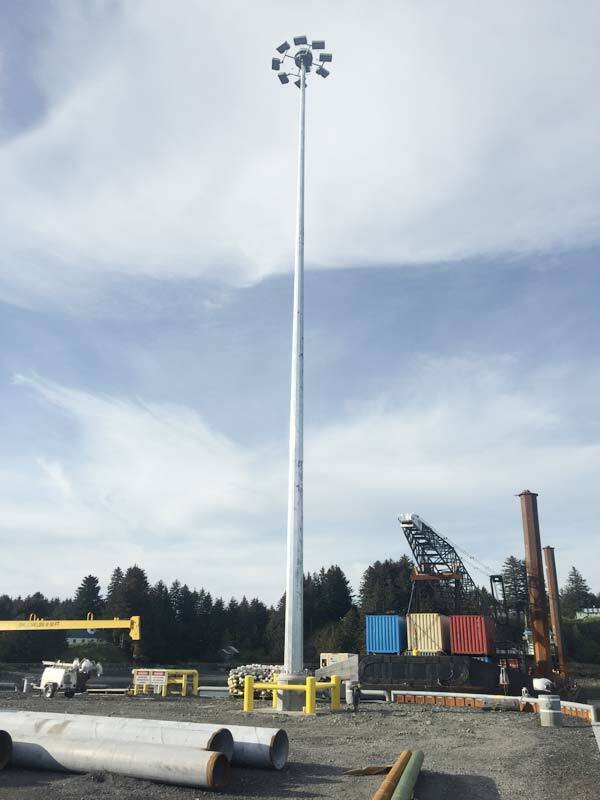 Crews installed two 48‐inch diameter, 160 feet in length plumb pile with rock anchors and four 30‐ inch diameter, 140 feet in length batter pile. Batter pile were rock anchored into bedrock. Each pile was installed using a vibratory hammer in combination with a D‐46 impact hammer. A 19 foot wide by 82‐foot transfer span weighing 110 tons, cast‐in‐ place concrete abutment, shore side concrete approach apron, a dry fire line and an electrical distribution and lighting system. Project was completed in the highly sensitive environment with strict environmental oversight. The design‐build approach allowed the owner to have great cost certainty and through completion only saw owner initiated, additional scope, change orders. 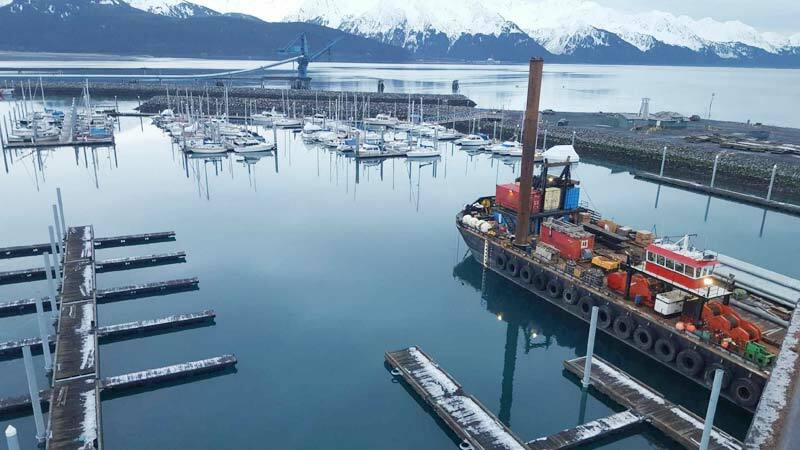 Turnagain Marine Construction was awarded a design-build contract to construct a heavy duty freight dock. The project owner, Kloosterboer Dutch Harbor, was looking for proposals to extend their existing facility’s berthing line to the southwest. 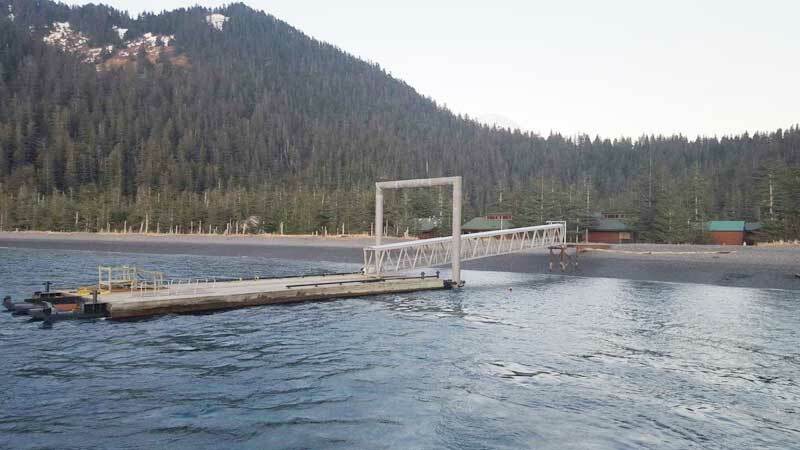 Turnagain Marine Construction proposed a complete turnkey design that not only met but exceeded Kloosterboer’s criteria. The dock would be constructed to allow for 750psf uniform loading while providing a 50 year service life. At the base of the dock there is galvanized steel pile that are capped with precast prestressed concrete panels. The fender system is comprised of HDPE sleeved steel pile along with a rubber energy absorber fender system. A heavy duty galvanized steel bull rail runs along the edge of the dock with 13 mooring bollards. The dock extension has mooring and berthing capabilities along the East and the West edge of the dock, as well as a diagonal berth on the south face of the dock. 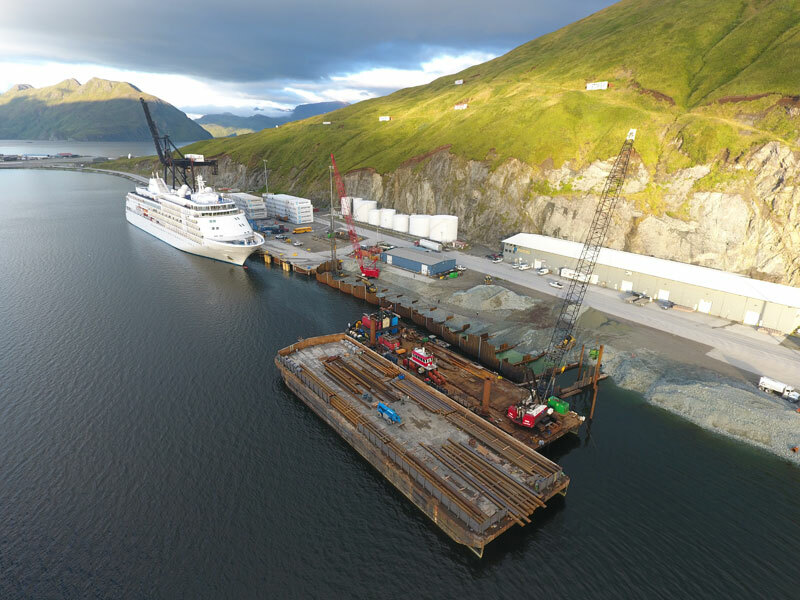 This system is well suited for commercial vessel operations and will allow Kloosterboer to grow its ever expanding business in Dutch Harbor, AK. 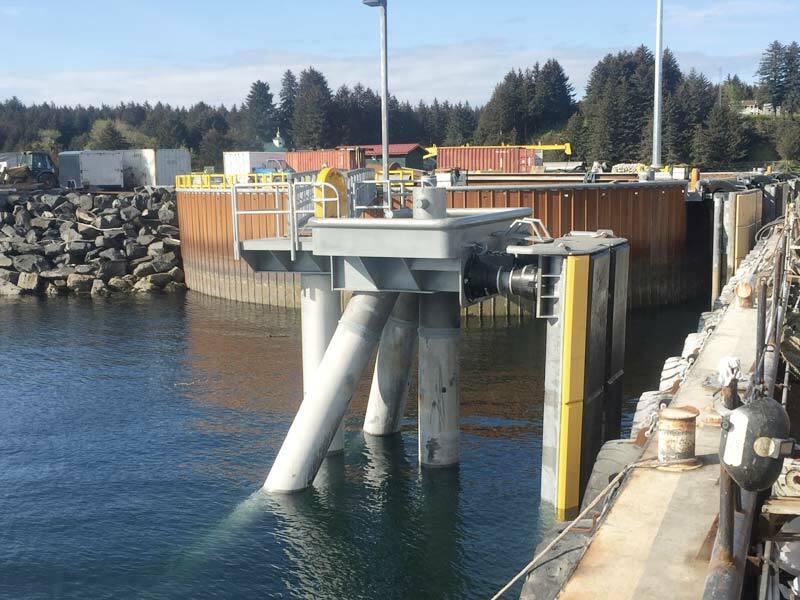 When the City of Kodiak decided to replace their vintage Channel Transient Float they wanted the most economical project available. With the best technical response and the lowest price Turnagain Marine Construction (Turnagain) was selected as the best value design‐build proposal. Turnagain proposed a complete turnkey design that not only met, but exceeded the City of Kodiak’s design criteria while providing a total construction duration within the City’s time constraints. For the extreme durability that was required at this particular site location, 36” diameter HDPE pipe was chosen for the floatation medium. The float structure consists of heavy creosote glulam timbers, ADA compliant steel grate decking, and an 8” galvanized bullrail. The fender system consisted of 1‐1/2” thick by 20” deep UHMW‐PE, these pile pockets were internal to the float system and were lined using the same UHMW‐PE. 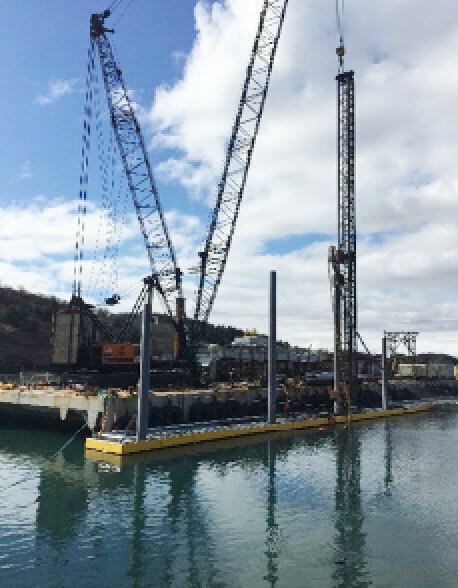 Highly durable 24” x .750” steel piling was utilized to secure the float system. The piling were driven through the existing overburden layer and then socketed into the bedrock to attain the designed loads. 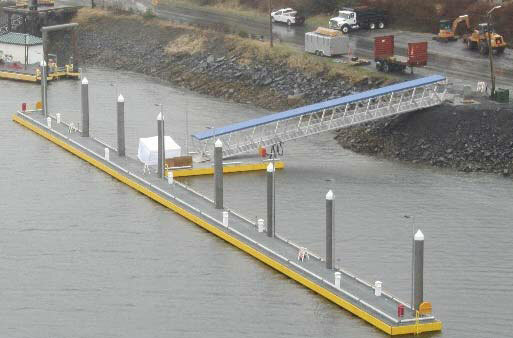 A shore side concrete abutment and aluminum gangway was utilized to access the floats. The gangway and float system were outfitted with an electrical system, potable water and a dry fire line system. Project was completed on‐time and with only owner initiated additional scope change orders. 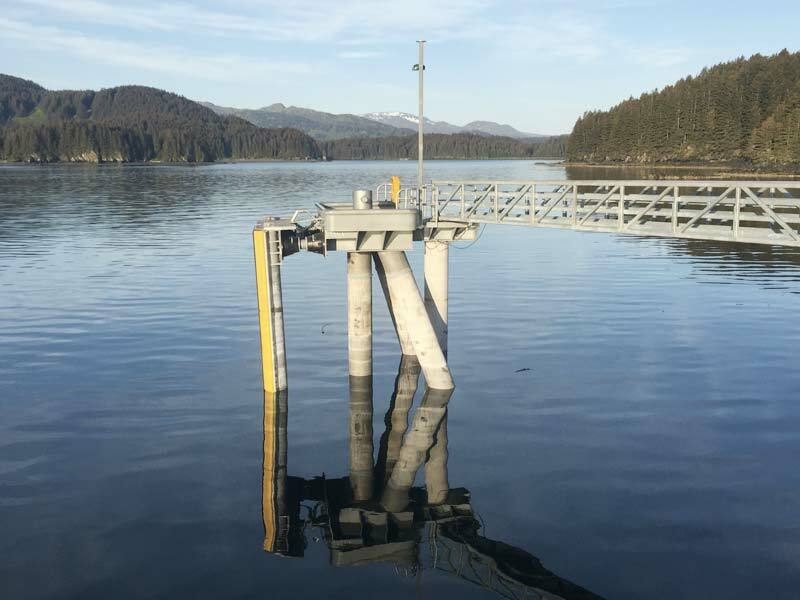 Turnagain removed the existing float facility and designed, constructed and installed an upgraded floating fuel facility. Turnagain managed the permitting process and provided constructability reviews at all stages of the design. 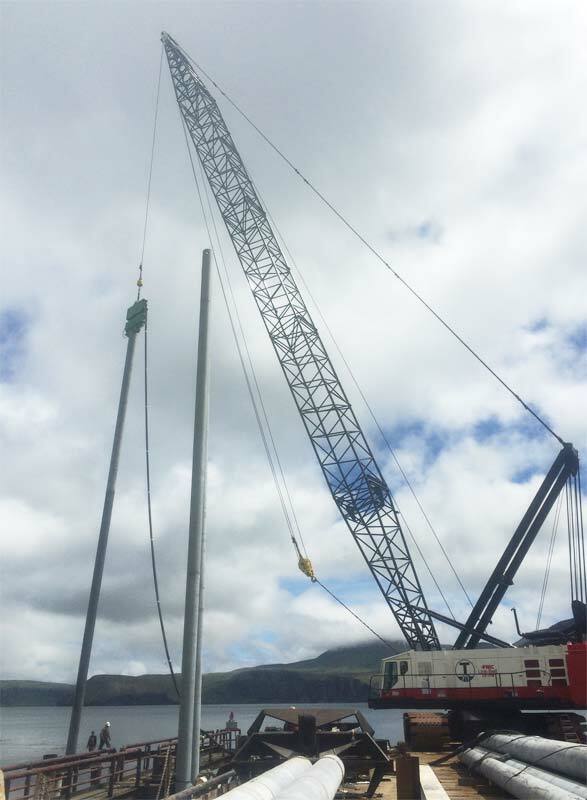 The new float was a heavy industrial dock moored with 4 socketed 30” diameter piling. Shallow bedrock required that the float piles be driven then drilled 15’ into rock. Turnagain used a bubble curtain for noise attenuation and implemented an invasive species control plan to insure clean operations. Based on past performance and quality of work, Petro Marine is a repeat client for Turnagain. 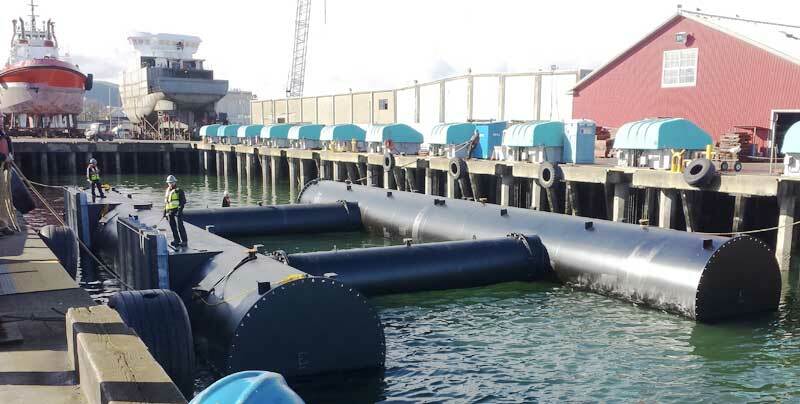 Scope – Remove existing float facility, design, construct, and install an upgraded floating fuel facility. Turnagain managed the permitting process and provided constructability reviews at all stages of the design. 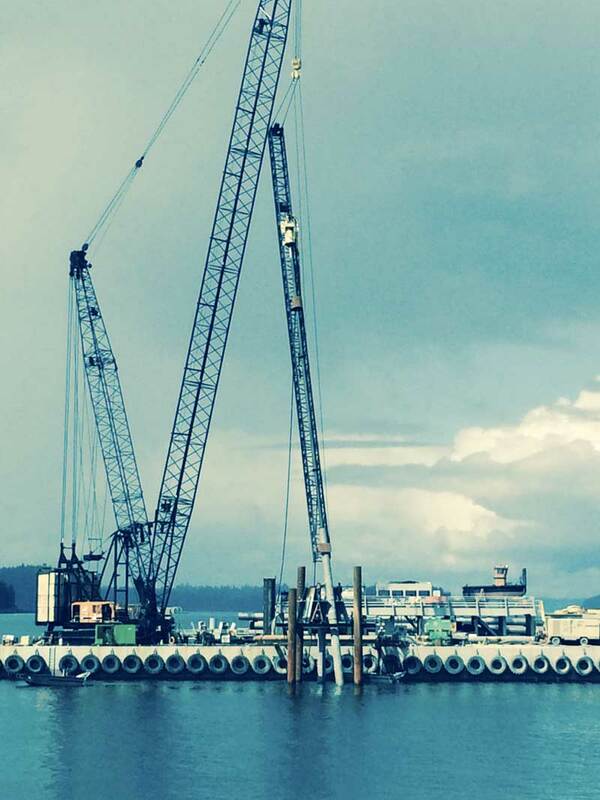 The new float was a heavy industrial dock moored with 4 socketed 30” diameter piling. Shallow bedrock required that the float piles be driven then drilled 15’ into rock. Turnagain used a bubble curtain for noise attenuation and implemented an invasive species control plan to insure clean operations. Based on past performance and quality of work, Petro Marine is a repeat client for Turnagain. 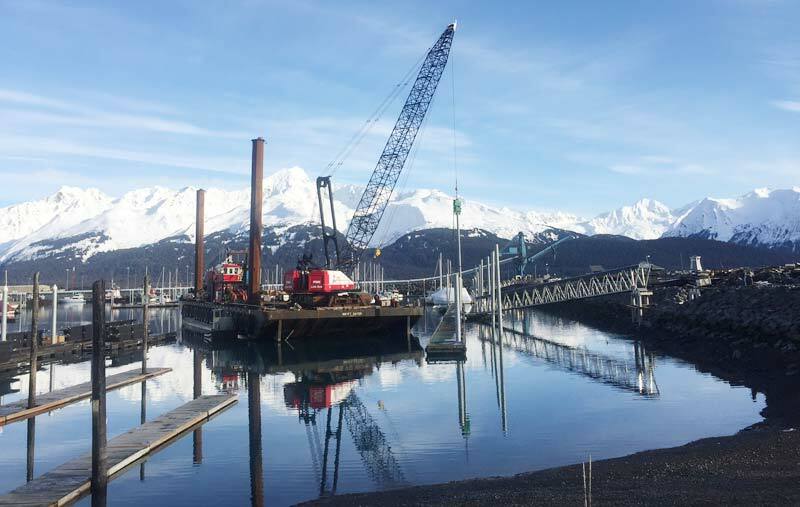 Turnagain Marine Construction was hired by an Alaskan 8(a) contractor to dredge, barge, and place over 4,000 cubic yards of bedding and armor rock in conjunction with the installation of the new Perryville Launch Ramp. 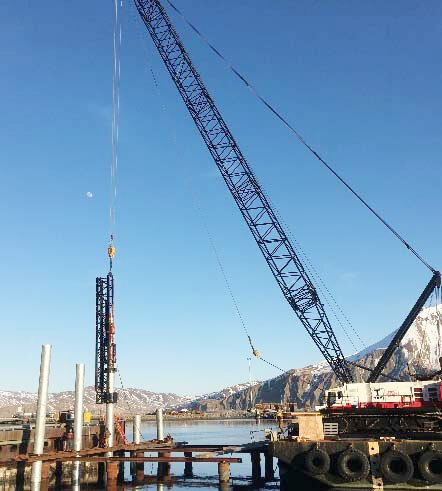 At this remote project site, Turnagain utilized GPS-positioning equipment to dredge and place armor in conjunction with the USACE specifications. 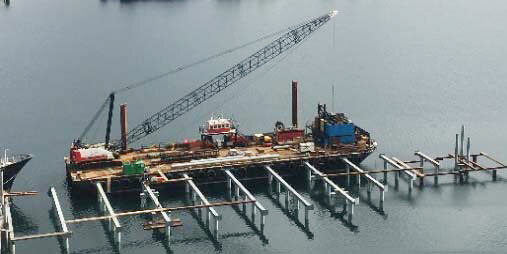 Scope of work also included placement of new precast concrete planks, barge coordination, and remote living conditions. 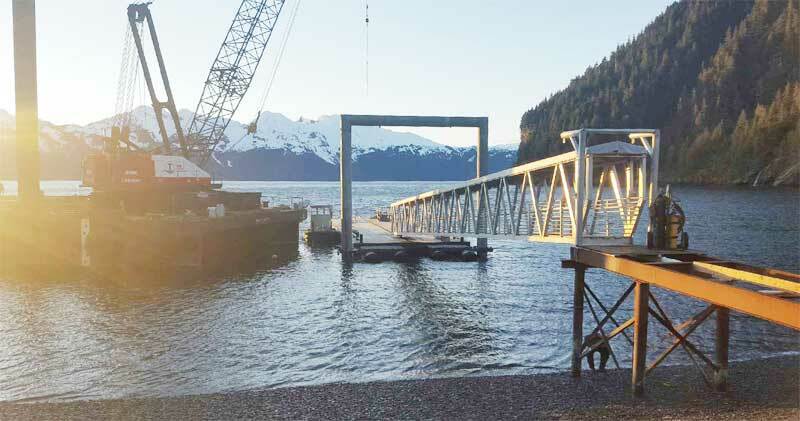 The Port Lions Ferry Terminal project sole-source, design-build which Jason Davis, Turnagain Marine Construction President, partnered with the City of Port Lions to develop a new ferry terminal facility. After two years of development and negotiation, the result was a new sheet-pile bulkhead accessed by a shot rock fill causeway faced with armor rock. 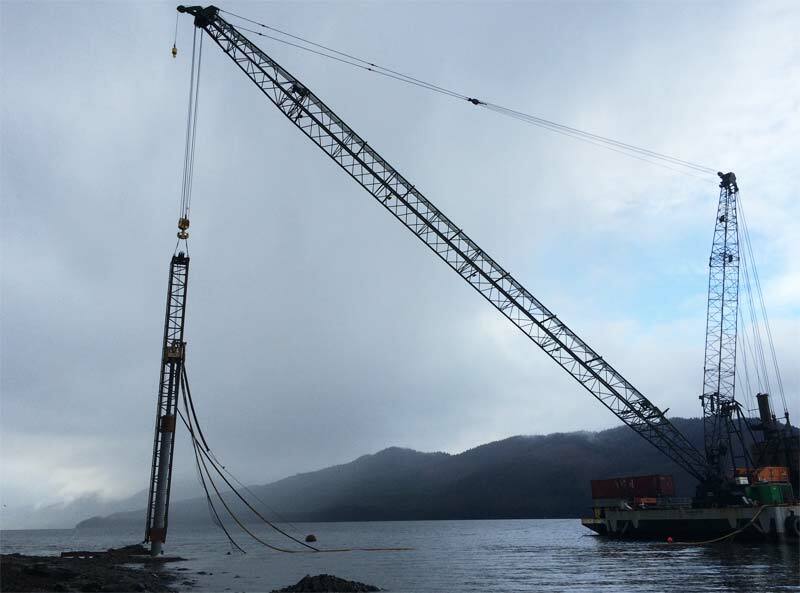 Crews quarried and placed over 30,000 CY of shot rock embankment, bedding stone, and armor rock delivered via barge from an offsite quarry while enduring rough Alaskan winter weather conditions. 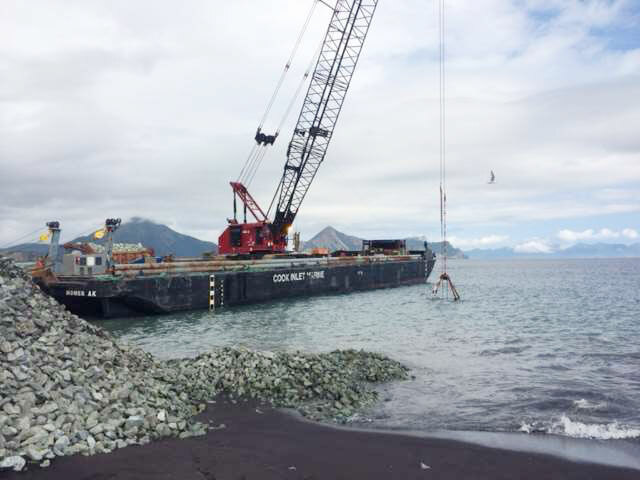 Located in the extreme tides and currents of Cook Inlet, Alaska, the Chevron Nikiski Shoreline Revetment project required the installation of 25,000 CY of bedding stone and armor stone. Due to the extreme environment of Cook Inlet, armor rock was required to be quarried from over 500 miles away and barged to the jobsite. 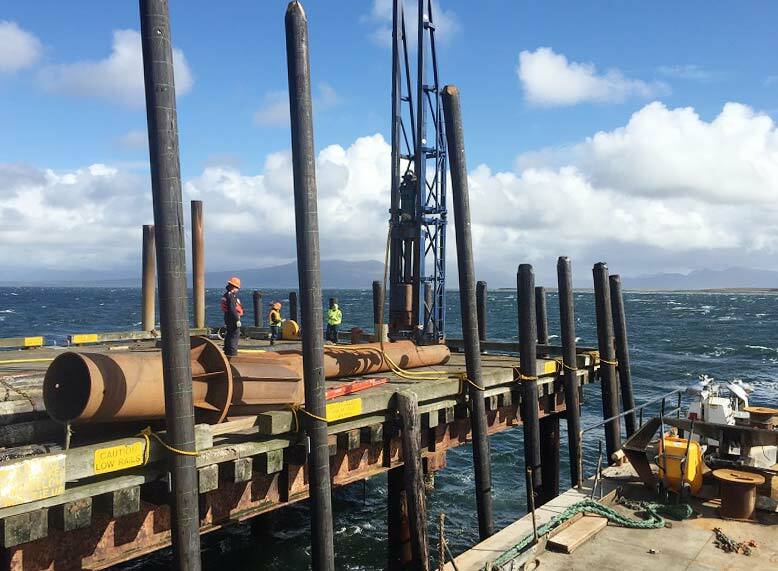 Onsite work included placement of bedding rock and armor stone in 35 feet of tide fluctuation, shoreline grading, and the demolition and excavation of the filled open-cell sheet pile bulkhead dock. Removal of the open-cell sheet pile bulkhead structure involved the handling and disposal of contaminated soils from within the excavation. 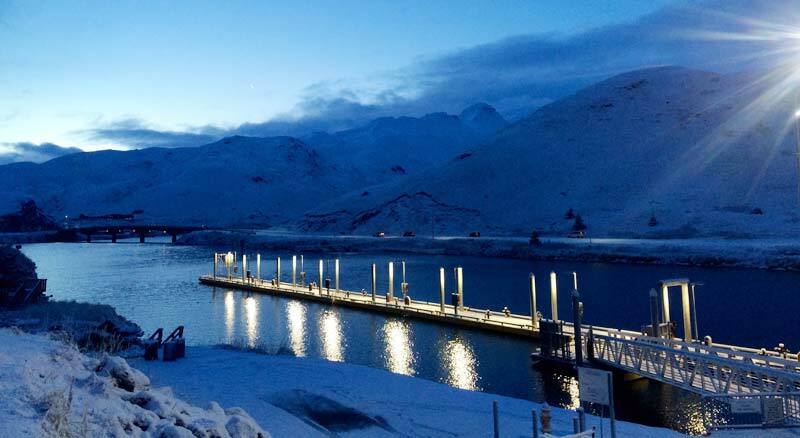 Turnagain Marine Construction was chosen to perform the construction of the Unalaska Marine Center Position III & IV Replacement through a best-value proposal. 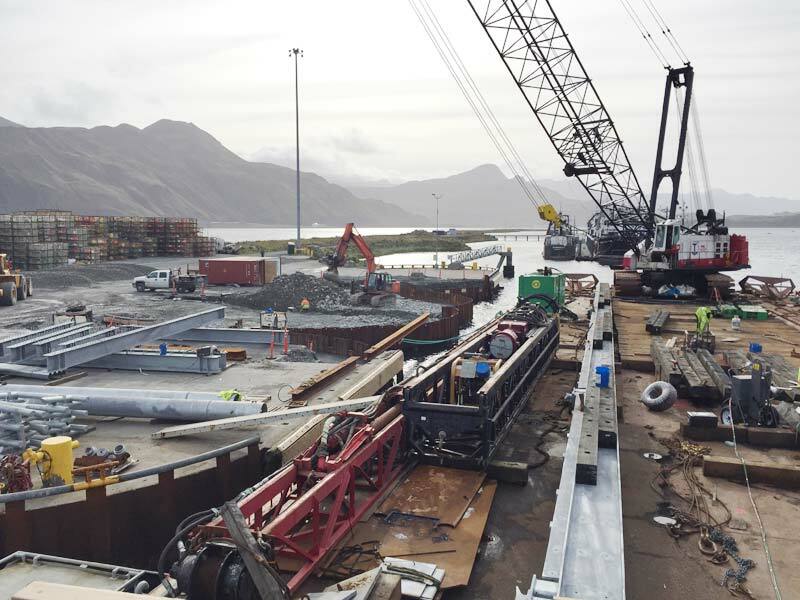 The massive replacement project for the International Port of Dutch Harbor and the City of Unalaska provides the port with the ability to accommodate larger container ships as well as more efficiently perform fishing vessel offloads. 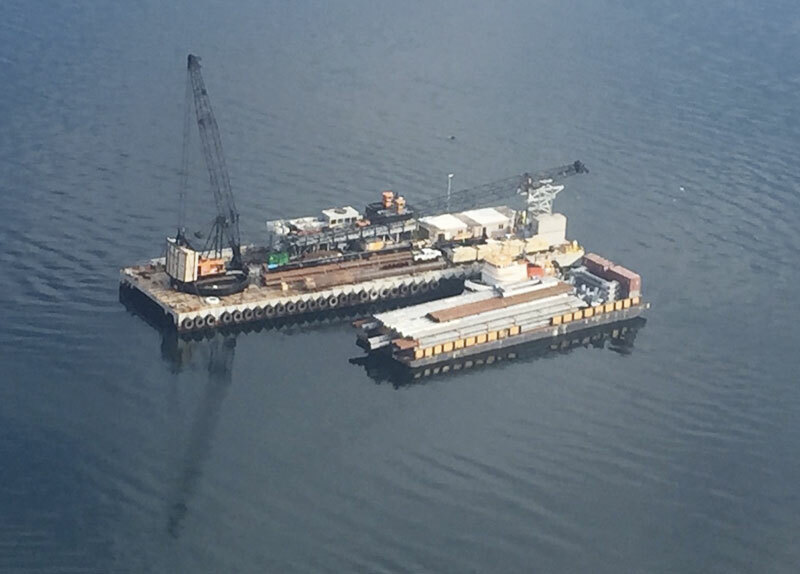 The project consisted of the construction of a 24-cell sheet pile bulkhead, fender and mooring systems, 1400LF of crane rail, 105,000SF of paver surfacing, full electrical, storm, sewer, water and fuel systems, and 12 each value engineered crane tie downs. 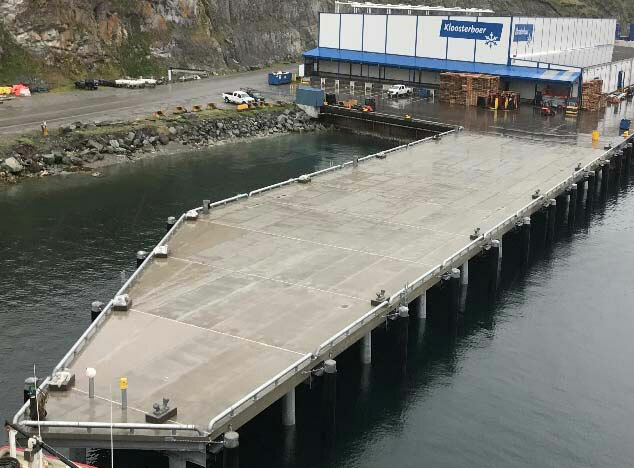 Prior to the award of the Position III and IV Replacement project, the Light Cargo Dock project was constructed in Unalaska by Turnagain. 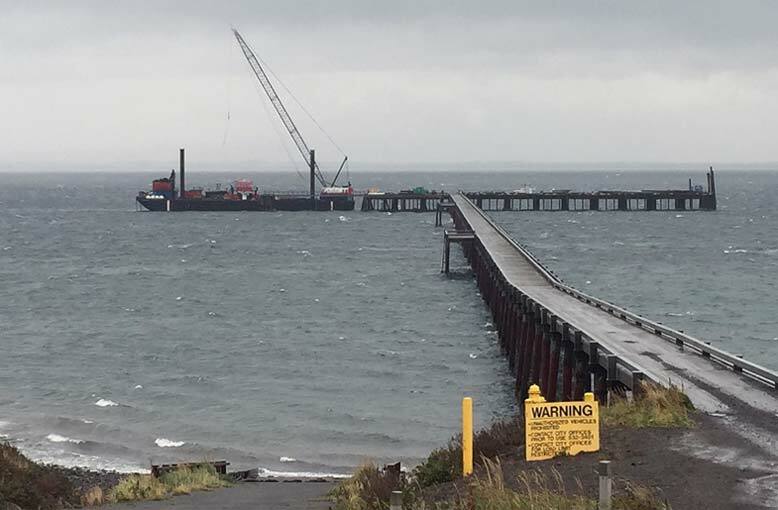 Crews completed activities associated with the new dock construction including structures demolition, armor rock removal and shoreline cleanup for disposal of debris. Copyright © 2015- Turnagain Marine Construction. Design by Yellow Interactive, Inc.